JAK Inhibitors are a new treatment option in clinical trial for Alopecia Areata. There are many questions and misconceptions about the trials and the history of this treatment option. 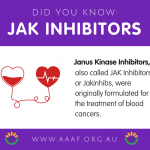 This infographic has been produced by AAAF to address some of the facts about JAK Inhibitors. « Your Art on a Beautiful Scarf!